This is yet another model to let your marbles run on your favorite bricks. 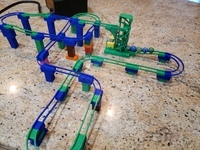 Using the customizer, you may choose your marble size, brick length, brick specifications and print your track parts, hopefully without any additional support necessary. The provided STL files are for traditional 8mm system bricks (Lego, for example) in sizes of 2, 3 and 4 pins, up to 16mm diameter marbles. Using the customizer, you can vary the marble size and brick type. Printing of several bricks will be aligned in a space saving grid. 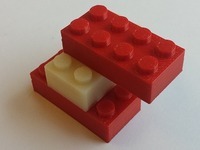 Before printing any of the sets, please check that single bricks work well with your brick and marble setup. An infill of 25% is sufficient. This model has three types of bricks: Straight lines, downslopes and right angle turns. 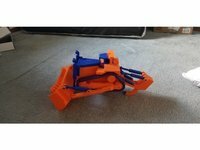 The bricks are designed for your marble size, and have integrated support for additive printing. Most probably, there are even more out there, sorry for missing any of them.